Rachel Hughey, Scott Johnston, Andrew Lagatta, and Christopher Schulte, partners in the Minneapolis office of Merchant & Gould, will be featured presenters at the 2016 Midwest IP Institute offered by Minnesota CLE September 22 & 23, 2016 in downtown Minneapolis. Two experienced practitioners – one a PTAB expert, the other a highly regarded appellate attorney – review the new PTAB rules, key cases out of the PTAB in the last year, and statistics that reveal emerging trends before the PTAB. In addition, they will engage in a practical discussion of several important new Federal Circuit and Supreme Court decisions impacting PTAB proceedings, including the Supreme Court’s recent Cuozzo decision. Trademark practitioners made far-reaching and sometimes inconsistent predictions about how the Supreme Court’s B&B Hardware v. Hargis Industries decision would impact trademark enforcement and proceedings at the Trademark Trial and Appeal Board. Mr. Johnston will discuss the trademark cases that have addressed issue preclusion since B&B was decided, share his research into the impact B&B has had on TTAB and district court cases, and provide some tips on how to take advantage of these recent changes. Brand protection overseas can be costly, but not protecting a mark in a foreign jurisdiction can be even more costly as most countries operate under a first-to-file system. Clients seek to use the same brand globally, and rebranding for one country can put a serious strain on a client’s profit. This session will provide insights from an in-house counsel and law firm practitioner on their techniques for handling overseas clearance, filing, maintenance and enforcement efforts in a way that manages the risks inherent in a global roll-out under a reasonable budget. The speakers will also address the impact of the Brexit on global portfolio management. 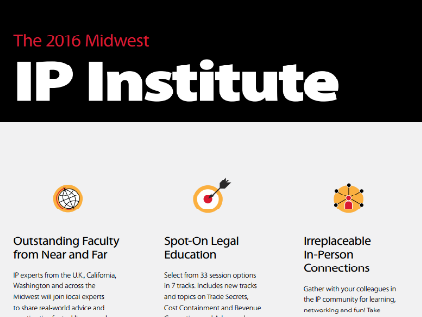 The 2016 Midwest IP Institute will keep you on top of all the latest developments. Guest speakers from across the country will join a faculty of talented IP lawyers from Minnesota to provide you with the most current guidance in all aspects of IP law, transactions and litigation. The agenda ensures an update on important new law, best practices, and trends – giving you practical instruction on dozens of current topics critical to your clients and your practice. Merchant & Gould is proud to support this Institute.